Morning Maniac is the CEO and Founder of EVE University and the Ivy League Alliance. 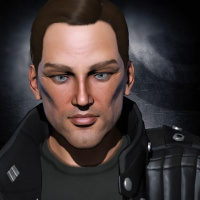 He started in EVE joining the NPC Corporation Caldari Steel. Because of the absence of players in the corporation, he helped in the Help Channel. He also started Foreign Legion, a mercenary corporation, and found the mercenary life enjoyable. Maniac founded EVE University on March 15th, 2004, a day before his real life birthday. He had hoped to run a channel or corporation more helpful than the regular help venues. He hopes students learn enough to graduate and move on, whether it be with newfound friends in the corporation or alone. "To me experience doesn't mean much at all. I've been in this game for 4 years, and success to me is not the amount of skill points. If you look at the big names in EVE and the people with the big wallets and the big reputations, they are not earned because they were particularly good at firing guns or missiles; it's because they are good at dealing with people, have good ideas that make them work either in Industry or PvP with strategic or tactical dealings and that's what makes you successful. Its really the guy behind the computer." - Morning Maniac in EVE University - Past, Present, and Future. This page was last modified on 23 May 2018, at 08:45. This page has been accessed 28,315 times.